The grandpappy of first-person shooters has returned to Xbox Live. 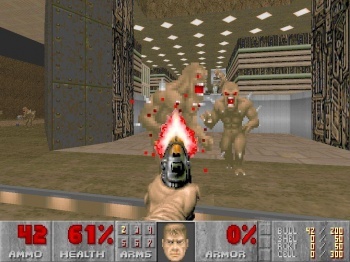 In October 2010, the Xbox Live Arcade version of id Software's classic demon-killin' simulator vanished from the service, with neither warning nor explanation. We still don't know exactly why the game was de-listed, though based on Microsoft's history of doing this sort of thing, one could easily assume that it was selling poorly and essentially just taking up space. Other games, including Ultimate Mortal Kombat 3 and Double Dragon have received the same fate, vanishing without warning, never to return. Unlike those two however, DOOM has been revived. As of today, the game can be downloaded from the Xbox Live Marketplace for the totally-worth-it price of $5 (400 Microsoft Points). Bethesda's official announcement of this whole thing offers no specific reason for the resurrection, leaving gaming journalists like myself to assume that even Microsoft is unable to stem the tide of demonic energy emanating from the classic series. Remember when Tipper Gore warned that DOOM was evil? Yeah, she was totally right. And if I've learned anything from twenty years of Castlevania sequels, it's that you can't kill evil, you can only hope to seal it away for a while.